The world breaks everyone, and afterward many are strong in the broken places. But those that will not break it kills. It kills the very good and the very gentle and the very brave impartially. If you are none of these you can be sure it will kill you too, but there will be no special hurry. Thirty years later at the age of 61, after a life-time of literally having it all and doing it all, Ernest Hemingway was a broken and despairing man. One day, while home alone in his Idaho cabin, he loaded his 12-gauge shotgun, put the barrel in his mouth, and pulled the trigger. Ernest Hemingway knew something about brokenness. When he was young he observed how ‘the world breaks everyone’ and he wrote about it. 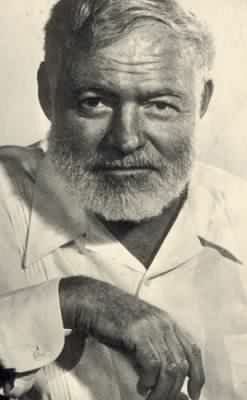 When he was old, he took his own life rather than face the all the ‘broken places.’ Hemingway was raised in the church, but very early in life rejected the faith of his youth and never looked back, except in scorn and derision. John Piper has said, “The key to the Bible is a broken heart.” Psalm 34:18 says, “The Lord is close to the brokenhearted and saves those who are crushed in spirit.” Life does indeed break us all, as the young Hemingway pointed out, and afterward, many are strong in the broken places. But the strength is only temporary and we get broken again and again, until finally we come to the biggest break of all when we die. “The key to the Bible is a broken heart,” said John Piper. If we allow our broken heart to open us up to the message of the Bible, we can find there the help and strength we need in all our brokenness, in life and in death. John Newton was one who was broken by life, and then looked to the Bible for healing. Before his conversion he done many wicked things, including serving as the captain of a slave ship. After his conversion he became a minister. As a parish pastor he would write hymns for his congregation to sing. One of the hymns he wrote was Amazing Grace in which he described how that grace saved even ‘a wretch like me.’ He was a broken man, but in his brokenness Newton looked to Jesus and was healed. It is not known who wrote the music for Amazing Grace. One theory is that it had its roots in Africa, and that Newton heard it sung by the slaves he was transporting across the ocean. If this is true, then this tune was also an expression of despair and brokenness. Psalm 34:18 — The Lord is close to the brokenhearted and saves those who are crushed in spirit. Psalm 119:67…71 — Before I was afflicted I went astray, but now I obey your Word… It was good for me to be afflicted so that I might learn your decrees. Psalm 51:17 — My sacrifice, O God, is a broken spirit; a broken and contrite heart you, God, will not despise. Psalm 147:3 — (The Lord) heals the brokenhearted and binds up their wounds. Abide with us, O Lord, for it is toward evening, and the day is far spent. Abide with us, for the days are hastening on, and we hasten with them, and our life is short and transient as a dream. Abide with us, for we are weak and helpless, and if you do not abide with us, we will perish. Abide with us, Oh Lord. Amen. This entry was tagged Bible. Bookmark the permalink.